Advances in surgical and anesthetic techniques combined with sophisticated perioperative monitoring are factors that have contributed to an expanding number of older adults undergoing surgery. A preoperative assessment is useful to identify factors associated with increased risks of specific complications and to recommend a management plan that minimizes the risks. Each person should be assessed individually, and judgments should be based on an individual's problem and physiologic status, not on age alone. According to estimates, 50% of older Americans will have an operation when older than 65 years. Older persons often have multiple comorbid conditions that limit their functional capacity and recovery and increase the risk of death. An initial complication is much more likely to lead to other complications; failure of one organ to function adequately is more likely to lead to failure of other organs. Perioperative management of the geriatric patient. Assessing patients with intermediate clinical predictors. Perioperative management of the geriatric patient. Assessing patients with minor or no clinical predictors. In one study, the mortality rate for patients older than 70 years undergoing elective cholecystectomy was nearly 10 times that for younger patients. In a study of abdominal operations, the mortality rate for patients aged 80-84 years was 3%; the rate was 9% for patients aged 85-89 years and 25% for those older than 90 years. Advanced age, poor functional status at baseline, impaired cognition, and limited support at home are risk factors for adverse outcomes. However, when age and severity of illness are directly compared, severity of illness is a much better predictor of outcome compared to age. Emergency operations carry a greater risk compared to elective operations in all age groups, particularly elderly persons. A complete history, physical examination, laboratory examinations, and an assessment of the surgical risks should be included for a preoperative evaluation of an elective surgery. Before surgery, system deficits should be identified, and attempts should be made to correct them. The patient, the consenting family member, or the legal guardian should be told about the procedure and any potential complications or disabilities. Decisional capacity is a prerequisite for providing legally and morally sufficient informed consent or refusal. A patient need not have the same level of awareness at all times to provide legally adequate informed consent. For instance, a patient may have windows of lucidity, while experiencing increased confusion in the evening (sundowning). Likewise, a patient whose short-term memory is compromised may still be able to judge the appropriateness of a suggested intervention. On the other hand, deficits in understanding or reasoning may be so severe that a patient should not bear the responsibility for making informed choices. In most cases, the care team makes the proper judgment regarding decisional capacity. Formal mental status testing can help determine whether a patient should be considered capable of making this type of decision. However, a score on a standard examination does not dictate a conclusion about capacity. If a patient is considered unable to provide informed consent, the first alternative is any specific written document or empowerment executed when the patient was capable of choosing and intended to direct future care. In some cases, a durable power of attorney makes decisions guided by specific instructions from the patient, by notions of substituted judgment and by the concept of best interest. The formal requirements for and binding power of living wills and durable power of attorney vary from state to state. A complete history of prior medical and surgical conditions and a full medication list are especially important. The patient should be instructed to bring all medications for assessment. Nutritional status should be determined because nutritional deficiencies are common in elderly persons. No screening battery has been shown to have good sensitivity and specificity for identifying persons at risk. The laboratory assessment of malnutrition generally includes a complete blood cell count, albumin level, and cholesterol determinations. Albumin levels of less than 3.2 g/dL in hospitalized older persons are highly predictive of subsequent mortality. A cholesterol level of less than 160 mg/dL in a frail elderly person has also been shown to be a risk marker for increased mortality. Results from a total lymphocyte count and anergy skin testing have not proven to be useful nutritional markers in older persons. A body mass index of less than 20 kg/m2 also suggests a problem. Because weight loss may lead to complications such as delayed wound healing, preoperative nutritional supplements should be provided when possible. This supplementation can include high-energy foods, vitamins, enteral feedings, or, if necessary, total parenteral nutrition. Psychological factors help predict outcome. Assessment of preoperative mental status is critical to understanding the etiology of postoperative cognitive status. Dementia is an extreme predictor of poor outcome, with surgical mortality rates increased by 52%. Social support systems are also important predictors of surgical outcome. A careful physical examination is necessary. The skin, oral mucosa, and tongue can provide information about hydration and nutrition. The neck should be examined for lymph nodes, thyroid masses, carotid pulsations, and bruits. Blood pressure should be measured, and the heart, lungs, and breasts should be examined. The abdomen should be examined for asymptomatic lesions, such as hernias, aortic aneurysms, and masses. Rectal examinations are mandatory, as are pelvic examinations in women. Femoral, popliteal, and pedal pulses should be noted, and any evidence of venous disease should be identified. Urinalysis, peripheral blood cell count, a limited blood chemistry profile, and measurements of coagulation factors are necessary. Perioperative serum electrolyte studies are useful for patients who take diuretics. A chest radiograph and an ECG are obtained before patients undergo surgery. Cardiac complications are among the most common and most serious postoperative problems. The strongest predictors of adverse cardiac outcomes are recent myocardial infarction (MI), uncompensated congestive heart failure (CHF), unstable ischemic heart disease, and certain cardiac rhythm disorders. A practice guideline for perioperative cardiovascular evaluation for noncardiac surgery is proposed by the American College of Cardiology and American Heart Association Task Force. [1, 2] The patients are assessed with a stepwise approach according to the clinical predictors, the risk of the proposed operation, and the functional capacity. The major clinical predictors are unstable coronary syndromes, decompensated CHF, significant arrhythmias, and severe valvular disease. Intermediate clinical predictors are mild angina pectoris, prior MI, compensated or prior CHF, and diabetes mellitus. Minor clinical predictors are advanced age, abnormal ECG findings, rhythm other than sinus, low functional capacity, history of stroke, and uncontrolled systemic hypertension. The assessment of functional capacity is based on energy expenditure. Activities requiring 1-4 metabolic equivalents (METs) include eating, dressing, using the bathroom, walking indoors, walking 1-2 blocks on level ground, and doing light housework. Activities requiring 4-10 METs include climbing stairs or walking up a hill; running a short distance; scrubbing floors or moving furniture; and recreational activities, such as golf, bowling, dancing, and playing tennis. Self-reported exercise tolerance has been shown to be useful for helping predict in-hospital perioperative risk, even when using relatively simple and familiar measures. Surgical procedures are also classified as high risk, intermediate risk, or low risk. High-risk procedures include major emergency operations, aortic and other major vascular procedures, peripheral vascular procedures, and anticipated prolonged procedures associated with large fluid shifts or blood loss. Intermediate-risk surgical procedures include carotid endarterectomy, head and neck procedures, intraperitoneal and intrathoracic procedures, orthopedic surgery, and prostate surgery. Low-risk surgical procedures include endoscopic procedures, skin and breast operations, cataract surgery, and superficial procedures. 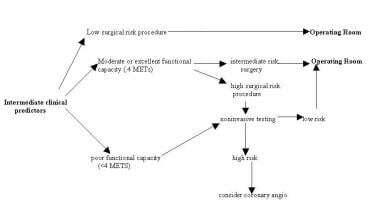 If an emergency surgery is needed, the patient's risk stratification and management is assessed afterwards. If the surgery is urgent or elective and if the patient has had coronary revascularization within 5 years and has had no recurrent symptoms or signs, then the patient may be taken to the operating room. If the patient has recurrent symptoms or signs but has had a recent coronary evaluation, such as angiogram or stress test, with a favorable result, then the surgery is performed. If the patient has major clinical predictors, consider performing coronary angiography or delaying the surgery. 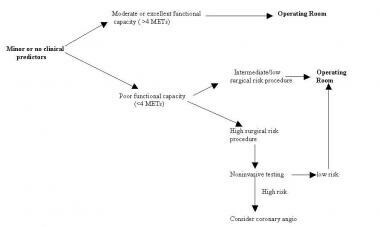 For high-risk patients who are not candidates for coronary revascularization, the consultant may wish to either (1) delay the upcoming operation if the patient's overall status can be improved or (2) cancel the operation if the risk posed by the patient's surgical condition is lower than the patient's cardiac risk. The use of coronary revascularization as a preventive step to reduce cardiac risk before noncardiac surgery has not been studied prospectively. A large retrospective analysis suggests that any decrease in risk produced by having coronary artery bypass graft surgery before having noncardiac surgery was offset by the risk posed by the angiography and coronary artery bypass grafting. The clinician deciding whether to refer the intermediate or high-risk patient for revascularization must weigh the added risks posed by angiography and coronary artery bypass grafting (or percutaneous transluminal coronary angioplasty or stent procedure) against the potential reduction in short-term (perioperative) and long-term risk. Some patients have an independent need for coronary bypass. In these patients, the planned noncardiac surgery may lead to investigation into coronary revascularization with a goal of reducing long-term morbidity and mortality. Whether the patient is a candidate for coronary revascularization should therefore be determined based on the same clinical grounds that govern the need for coronary revascularization in the nonoperative setting. An individualized approach that weighs patient preferences, the urgency of the upcoming operation, and the urgency of the patient's coronary status is recommended. When the clinical predictors are intermediate, minor, or not present, decisions regarding the operation and further testing depend on the risk of the procedure and the patient's functional capacity (see the following 2 images). Noninvasive tests available for further risk stratification include those that assess left ventricular function (radionuclide angiography), cardiac ischemia (exercise or pharmacologic stress testing and ambulatory electrocardiographic monitoring), or both (dobutamine stress echocardiography). Exercise stress testing cannot be performed in a significant proportion of patients who are undergoing vascular surgery (30-70%) or in patients with diseases that impair walking ability. Dipyridamole-thallium imaging and dobutamine stress echocardiography, especially if the results are negative, provide useful information on stratification for patients having vascular surgery who are determined to be at intermediate risk according to clinical evaluation. Although not well studied, very elderly persons can have presbycardia (decreased function of cardiac muscle) and silent coronary artery disease even in the absence of cardiac risk factors. Consider noninvasive testing if a very stressful surgery is planned. Because of the lack of controlled evidence, no recommendations can be made either for or against the use of other medical therapies, such as digitalis, nitrates, or calcium-channel antagonists. Therapy with these drugs should be continued or started based on the same criteria that would apply in the nonoperative setting. If the initial evaluation indicates mild or moderate hypertension and no associated metabolic or cardiovascular abnormalities, no reason exists to delay the surgery. Antihypertension medications should be continued during the perioperative period; however, a diastolic blood pressure of 110 mm Hg or higher requires control before undergoing the surgery. Importantly, do not withdraw beta-blockers and clonidine because of potential heart rate and blood pressure rebound. In the postoperative period, acute elevations in blood pressure are common. Labile blood pressures, sometimes with significant hypotension, can occur in patients with hypertension. Occasionally, uncontrolled pain, ischemia, fluid overload, emergence excitement, electrolyte abnormalities, anxiety, or a distended bladder can cause hypertension. As much as 30% of postoperative hypertension is idiopathic and resolves within 3 hours. When secondary causes are not responsible for the rise in the blood pressure, treatment with calcium channel antagonists, beta-blockers, and drugs that block both alpha- and beta-adrenergic receptors should be considered. Hydralazine, a potent vasodilator, should be avoided in patients with hypertensive hypertrophic cardiomyopathy because the diastolic filling can be compromised by reflex tachycardia from rapid vasodilatation. Studies have shown that CHF is a significant risk factor associated with poorer outcomes. In patients aged 65 years and older, heart failure patients undergoing major noncardiac surgery experience substantial morbidity and mortality despite advances in perioperative care, whereas those with coronary artery disease without heart failure have similar mortality compared with a more general population. Identifying heart failure based on findings from a careful history and physical examination is important. If possible, the cause should be identified and treated accordingly. Despite the technical advantages of Swan-Ganz catheters and intraoperative transesophageal echocardiogram, no single monitoring method has been shown to improve patient outcomes or be cost-effective. CHF and clinically significant arrhythmias require in-depth evaluation and control before elective, noncardiac surgery is performed. Uncontrolled preoperative arrhythmias are aggravated by the stress associated with the induction of anesthesia and intubation of the airway. Pulmonary disease increases the risk of postoperative complications, accounting for 40% of postoperative complications and 20% of deaths. Age-related changes, such as increased closing volumes and decreased expiratory flow rates, predispose older persons to pulmonary complications. The additive effect of supine position, general anesthesia, and abdominal incisions leads to a significant reduction in functional residual capacity and an associated increase in airway resistance. The combination of these effects predisposes patients to atelectasis, with the risks of hypoxemia and infection. Additionally, postoperative pain and use of analgesics contribute to a reduced tidal volume and impaired clearing of secretions dependent on adequate coughing and deep breathing. The preoperative functional level has been shown to be a reliable predictor of pulmonary complications. Interventions, such as preoperative smoking cessation, antimicrobial therapy for bronchitis, perioperative bronchodilator therapy, optimization of therapy for uncompensated right heart failure, inhalation of humidified gas, postural drainage, and chest physiotherapy, can reduce pulmonary complications, lower mortality, and shorten hospital stays. Pulmonary function testing is indicated in patients considered for lung resection. Abnormalities suggesting an increased risk of postoperative pulmonary complications include a vital capacity of less than 50% of predicted, a forced expiratory volume in one second of less than 2 L or less than 50% predicted, or the presence of substantial hypoxemia or hypercapnia. Renal disease has an important impact on patient morbidity and the postoperative course. Renal disease may not be considered in older patients because the reduction in creatinine clearance is usually not reflected by a rise in the serum creatinine level. The serum creatinine level must be adjusted for age and the decrease in lean body mass. Preoperative renal status is the best universal predictor of postoperative renal failure. Paying close attention to volume status, aggressively treating infections, and avoiding the use of nephrotoxic drugs are critical to minimizing postoperative renal deterioration in older adults. Diabetes mellitus is an intermediate clinical predictor of perioperative myocardial ischemia not only because of the association between diabetes mellitus and coronary artery disease but also because of the increased incidence of other perioperative complications, including ketoacidosis, stroke, renal failure, and sepsis. Recommendations for the control of blood sugar levels are made based on the extent of surgery and the likelihood of either early or delayed resumption of a normal diet. The glucose level should be less than 300 mg/dL preoperatively (preferably < 200 mg/dL). Prevention of hyperglycemia during the perioperative period has been shown to improve wound healing, to reduce the risk of infection, and to reduce cerebral damage in the presence of a hypoxic event; however, the risk of severe cerebral injury from inadvertent, unrecognized hypoglycemia outweighs any benefit of strict perioperative control. According to studies, diabetic patients undergoing major noncardiac surgery appear to have a high mortality rate, often because of cardiovascular death. An estimated 20-30% of patients undergoing general surgery without prophylaxis develop deep vein thrombosis, and the incidence rate is as high as 40% in those undergoing hip and knee surgery, gynecologic cancer operations, open prostatectomies, and major neurosurgical procedures. Renal function should be considered when making decisions about the use and/or the dose of low molecular weight heparin (LMWH), fondaparinux, and other antithrombotic drugs that are cleared by the kidneys, particularly in elderly patients, patients with diabetes mellitus, and those at high risk for bleeding. Depending on the circumstances, the recommendation is avoiding the use of an anticoagulant that bioaccumulates in the presence of renal impairment, using a lower dose of the agent, or monitoring the drug level or its anticoagulant effect. Neuropsychiatric problems are common among older patients, and assessment of preoperative mental status is critical to understanding the etiology of postoperative cognitive status. Delirium, dementia, and depression are the most common important syndromes to consider. Of all patients admitted for repair of hip fractures, 15% have dementia. Depression is also common among older patients and can be exacerbated by any acute illness or hospitalization. The major manifestation of delirium is an abrupt change in cognition and consciousness. In hospitalized elderly persons with delirium lasting more than 1 week, the likelihood is that severe cognitive impairment, sleep pattern disturbance, and mood lability will be worse compared to those with delirium of shorter duration. New-onset visual hallucinations in elderly patients are more suggestive of delirium than of a new psychiatric disorder. Delirium develops in at least 15% of older surgical patients, and studies show that hospitalized patients with delirium have higher rates of morbidity compared to hospitalized patients in control groups and that delirium is a predictor of poor outcome. The length of stay in the hospital for a patient with delirium is increased by 60%, and their rate for nursing home placement is 5 times higher. Age; poor cognitive function; poor physical function; self-reported alcohol abuse; aortic aneurysm surgery; noncardiac thoracic surgery; and abnormal preoperative sodium, potassium, or glucose levels were found as independent, specific factors that preoperatively predicted postoperative delirium in elderly patients. Other independent precipitating factors are the use of physical restraints, malnutrition, respiratory insufficiency, dehydration, addition of more than 3 medications, and any iatrogenic event, such as nosocomial infection. Vulnerability factors are visual impairment (visual acuity < 20/70), severe illness upon admission (acute physiology and chronic heath evaluation [APACHE] II score >16), cognitive impairment (Mini-Mental State Examination score < 24), and blood urea nitrogen/creatinine ratio greater than 18. Intraoperative factors include the type of surgery, hypoperfusion, and anesthetic drugs. Delirium occurs after general surgery in 10-15% of patients, after orthopedic surgery in 28-61% of patients, and after cataract surgery in 1-3% of patients. After surgery for femoral neck fractures or bilateral knee replacements, delirium occurs in up to 61% of elderly patients. Several studies have found no difference in the effects of general, epidural, or spinal anesthesia on postoperative delirium rates if medications are controlled for in the analysis. Intraoperative meperidine use increases the risk of delirium by 2-7 times that of other opioids. Intraoperative use of barbiturates and long-acting benzodiazepines also increases the risk of postoperative delirium. Postoperative factors associated with delirium include hypoxia and hypocapnia. The rate of postoperative delirium decreases from 61.3% to 47.6% when geriatric assessment is performed both preoperatively and postoperatively and when appropriate interventions are implemented. Studies are now underway to see if perioperative donepezil use can decrease postoperative confusion and delirium. Perioperative interventions should focus on thrombosis prophylaxis, oxygen therapy, prevention and treatment of perioperative hypotension, and prompt identification and treatment of postoperative complications. Improving orientation by placing clocks, calendars, and appropriate lighting; decreasing sensory overload; providing reassurance; and using personal hearing aids and eyeglasses are some of the nonpharmacologic interventions for delirium. Intubated patients should have access to communication via word boards and paper and pencil. Physical restraints have not been shown to be safe or effective in the management of delirium. The use of physical restraints combined with sensory deprivation may cause further cognitive impairment. Observation by the nursing staff or family members provides better patient care than physical restraints. When alcoholism is suggested, the patient should be questioned about symptoms or signs of physiologic dependence and any organ damage. Withdrawal from alcohol or benzodiazepines should be considered in delirium that occurs within 24-72 hours of hospitalization. Prophylactic treatment for anticipated alcohol withdrawal should include thiamine and short-acting benzodiazepines. Elective surgery should be delayed until the risk of delirium tremens has abated. Prescribers should use the lowest effective dose of benzodiazepines and antipsychotics for the shortest duration, and only after behavioral interventions have failed. Patients with Parkinson disease require special attention during the perioperative period. Withholding medications in patients who are NPO can cause significant worsening of symptoms. Patients may experience hypoxia from stiffening of chest wall muscles, transfer dysphagia, and worsened tremor (which can cause increased pain at the operative site). If possible, a weighted feeding tube can be used to administer the medication at appropriate times. Patients who take levodopa may develop orthostatic hypotension, nightmares, hallucinations, and, occasionally, delirium, all of which may worsen with the addition of surgery and anesthesia. Anticholinergic drugs, such as trihexyphenidyl, are used alone in the early stages of treatment and later to supplement levodopa. Adverse effects may include dry mouth, urinary retention, constipation, confusion, delirium, and impaired thermoregulation due to decreased sweating. Catechol O-methyltransferase (COMT) inhibitors, such as tolcapone and entacapone, inhibit the breakdown of dopamine and therefore appear to be useful as adjuncts to levodopa. In some patients with mild on-off problems, selegiline, a monoamine oxidase type B inhibitor, helps diminish the effects of the waning effectiveness of the levodopa dose. Selegiline can potentiate the dyskinesias, adverse mental effects, and nausea produced by levodopa, and the dose of levodopa may have to be reduced. Amantadine, possibly augmenting dopaminergic activity, anticholinergic effects, or both, is useful in treating early mild parkinsonism. Adverse effects include lower extremity edema, livedo reticularis, and confusion. Meperidine and propoxyphene should be avoided in elderly persons because of the accumulation of toxic metabolites and the potential severe reaction. Pain management is a crucial aspect of perioperative care. Depression, anxiety, fear, fatigue, and cognitive impairment can affect the perception of pain. The treatment plan should anticipate the need for pain control. The assessment and treatment plan should be individualized, and it should be assessed and modified frequently based on the patient's response. Both medical and nonpharmacologic approaches, such as physical agents and cognitive-behavioral approaches, should be used. Pain medication should be given at regular intervals, with additional doses available for breakthrough pain. The risk of addiction to opioids is small when used for acute pain syndromes. The adverse effects of opioids should be kept in mind and addressed appropriately. Meperidine and propoxyphene should be avoided because of toxic metabolite accumulation. To avoid the risk of acetaminophen toxicity, the dose should not exceed 4 g/d in older patients with normal liver function. Older persons who are hospitalized for acute illnesses, including surgical interventions, often lose their independence and are discharged to institutions for long-term care. Specific changes in the provision of acute hospital care can improve the ability of a heterogeneous group of acutely ill older patients to perform basic activities of daily living at the time of discharge from the hospital and can reduce the frequency of discharge to institutions for long-term care. Specialized acute-care geriatric units have been created and have shown improved patient outcomes without increased costs. Units have environmental enhancements appropriate for older patients, such as improved lighting, contrasting colors, bold patterns, furnishings suited for elderly persons, uncluttered hallways, large clocks and calendars, and handrails. Patient-centered care emphasizes independence, including specific protocols for the prevention of disability and for rehabilitation. The focus is on discharge planning, with the goal of returning the patient to his or her home. Medical care is intensely reviewed to minimize the adverse effects of procedures and medications. Individualized care; consultation with specialists in multiple disciplines, such as nurses, social service counselors, and pharmacists; and physical and occupational therapy whenever possible promote an optimal patient outcome. Eagle KA, Brundage BH, Chaitman BR, Ewy GA, Fleisher LA, Hertzer NR, et al. Guidelines for perioperative cardiovascular evaluation for noncardiac surgery. Report of the American College of Cardiology/American Heart Association Task Force on Practice Guidelines. Committee on Perioperative Cardiovascular Evaluation for Noncardiac Surgery. Circulation. 1996 Mar 15. 93(6):1278-317. [Medline]. Fleisher LA, Fleischmann KE, Auerbach AD, et al. 2014 ACC/AHA guideline on perioperative cardiovascular evaluation and management of patients undergoing noncardiac surgery: a report of the American College of Cardiology/American Heart Association Task Force on practice guidelines. J Am Coll Cardiol. 2014 Dec 9. 64 (22):e77-137. [Medline]. Siddiqui AK, Ahmed S, Delbeau H, Conner D, Mattana J. Lack of physician concordance with guidelines on the perioperative use of beta-blockers. Arch Intern Med. 2004 Mar 22. 164(6):664-7. [Medline]. Mahla E, Baumann A, Rehak P, Watzinger N, Vicenzi MN, Maier R, et al. N-terminal pro-brain natriuretic peptide identifies patients at high risk for adverse cardiac outcome after vascular surgery. Anesthesiology. 2007 Jun. 106(6):1088-95. [Medline]. Feringa HH, Schouten O, Dunkelgrun M, Bax JJ, Boersma E, Elhendy A, et al. Plasma N-terminal pro-B-type natriuretic peptide as long-term prognostic marker after major vascular surgery. Heart. 2007 Feb. 93(2):226-31. [Medline]. Choi JH, Cho DK, Song YB, et al. Preoperative NT-proBNP and CRP predict perioperative major cardiovascular events in non-cardiac surgery. Heart. 2010 Jan. 96(1):56-62. [Medline]. [Full Text]. [Guideline] Hirsh J, Guyatt G, Albers GW, Harrington R, Schünemann HJ. Executive summary: American College of Chest Physicians Evidence-Based Clinical Practice Guidelines (8th Edition). Chest. 2008 Jun. 133(6 Suppl):71S-109S. [Medline]. Kat MG, de Jonghe JF, Vreeswijk R, et al. Mortality associated with delirium after hip-surgery: a 2-year follow-up study. Age Ageing. 2011 May. 40(3):312-8. [Medline]. American Geriatrics Society Expert Panel on Postoperative Delirium in Older Adults. Postoperative delirium in older adults: best practice statement from the American Geriatrics Society. J Am Coll Surg. 2015 Feb. 220 (2):136-48.e1. [Medline]. Hand L. Postoperative Delirium Guideline for Older Adults Issued. Medscape Medical News. Available at http://www.medscape.com/viewarticle/835292. November 21, 2014; Accessed: November 3, 2015. McKeown JL. Pain Management Issues for the Geriatric Surgical Patient. Anesthesiol Clin. 2015 Sep. 33 (3):563-76. [Medline]. American College of Physicians. Guidelines for assessing and managing the perioperative risk from coronary artery disease associated with major noncardiac surgery. Ann Intern Med. 1997 Aug 15. 127(4):309-12. [Medline]. Ballotta E, Da Giau G, Ermani M, et al. Early and long-term outcomes of carotid endarterectomy in the very elderly: an 18-year single-center study. J Vasc Surg. 2009 Sep. 50(3):518-25. [Medline]. Dunlop WE, Rosenblood L, Lawrason L, Birdsall L, Rusnak CH. Effects of age and severity of illness on outcome and length of stay in geriatric surgical patients. Am J Surg. 1993 May. 165(5):577-80. [Medline]. Egol KA, Strauss EJ. Perioperative considerations in geriatric patients with hip fracture: what is the evidence?. J Orthop Trauma. 2009 Jul. 23(6):386-94. [Medline]. Hernandez AF, Whellan DJ, Stroud S, Sun JL, O'Connor CM, Jollis JG. Outcomes in heart failure patients after major noncardiac surgery. J Am Coll Cardiol. 2004 Oct 6. 44(7):1446-53. [Medline]. Juul AB, Wetterslev J, Kofoed-Enevoldsen A. Long-term postoperative mortality in diabetic patients undergoing major non-cardiac surgery. Eur J Anaesthesiol. 2004 Jul. 21(7):523-9. [Medline]. Landefeld CS, Palmer RM, Kresevic DM, Fortinsky RH, Kowal J. A randomized trial of care in a hospital medical unit especially designed to improve the functional outcomes of acutely ill older patients. N Engl J Med. 1995 May 18. 332(20):1338-44. [Medline]. Lee DK, Mulder GD. Foot and ankle surgery: considerations for the geriatric patient. J Am Board Fam Med. 2009 May-Jun. 22(3):316-24. [Medline]. [Full Text]. Levinson W, Roach K, Altkorn D, Stern S. Update in general internal medicine. Ann Intern Med. 1998 Aug 1. 129(3):212-20. [Medline]. McGory ML, Kao KK, Shekelle PG, et al. Developing quality indicators for elderly surgical patients. Ann Surg. 2009 Aug. 250(2):338-47. [Medline]. Older P, Hall A, Hader R. Cardiopulmonary exercise testing as a screening test for perioperative management of major surgery in the elderly. Chest. 1999 Aug. 116(2):355-62. [Medline]. Reilly DF, McNeely MJ, Doerner D, Greenberg DL, Staiger TO, Geist MJ, et al. Self-reported exercise tolerance and the risk of serious perioperative complications. Arch Intern Med. 1999 Oct 11. 159(18):2185-92. [Medline]. Sager MA, Rudberg MA, Jalaluddin M, Franke T, Inouye SK, Landefeld CS, et al. Hospital admission risk profile (HARP): identifying older patients at risk for functional decline following acute medical illness and hospitalization. J Am Geriatr Soc. 1996 Mar. 44(3):251-7. [Medline]. Seymour DG, Pringle R. Post-operative complications in the elderly surgical patient. Gerontology. 1983. 29(4):262-70. [Medline]. Thomas DR, Ritchie CS. Preoperative assessment of older adults. J Am Geriatr Soc. 1995 Jul. 43(7):811-21. [Medline]. Welsby IJ, Um J, Milano CA, Ortel TL, Arepally G. Plasmapheresis and heparin reexposure as a management strategy for cardiac surgical patients with heparin-induced thrombocytopenia. Anesth Analg. 2010 Jan. 110(1):30-5. [Medline]. Zaugg M, Tagliente T, Lucchinetti E, Jacobs E, Krol M, Bodian C, et al. Beneficial effects from beta-adrenergic blockade in elderly patients undergoing noncardiac surgery. Anesthesiology. 1999 Dec. 91(6):1674-86. [Medline].